Have a suggestion to improve this page? Whether you're a human being, an insect, a microbe, or a stone, this verse is true. All that you touch You Change. All that you Change Changes you. The only lasting truth Is Change. God Is Change. In Parable of the Sower, a young-adult science-fiction dystopian novel by African-American science-fiction writer Octavia Butler, the protagonist, Lauren, writes a fictional book titled Earthseeds: The Books of the Living. The overarching theme of the book is God is Change. For Lauren, religion is about action, because the nature of reality is change. The way to be a good Earthseed follower is to go out and make the world better. She lives in a world of constant change; mostly pessimistic, depressing, change. Within that change, she always carries hope. The need to steal or even murder in order to save oneself or a loved one is a dilemma that is presented in the novel several times. The protagonist needs to make very difficult choices to survive. There are many other ethical questions posed in the book about the role an individual should take in making the world better. While the theme concentrates mostly on societal issues, I wonder what Ms. Butler would say about applying Earthseed’s teachings to science. The reason I have begun the unit with this classic young-adult novel is because I believe that education should be taught through various lenses and using different mediums. Introducing a science concept by using a quote from a novel may be a good way to engage students who are, otherwise, intimidated by science. They can make connections to text that they are more familiar with and use that as a vehicle to guide them in the understanding of some more complex science concepts. According to science writer, Carl Zimmer, who spoke at our seminar, people love to hear stories. He encouraged us to try to teach science through these stories. Professor Paul Turner begins his seminar presentations by showing an image of a historical figure. He tells a story and then makes the connection to the science lesson of the day. It is engaging, and a strategic way to pull the audience to the rest of the presentation. In our hands, we now hold the tools to make great scientific change. When Butler wrote the words The only lasting truth is Change, gene drive technology had not been discovered. At the time, it was unimaginable that decades later, change in organisms would be viable using gene drive technology. Although she was a science fiction writer, again, I believe she was writing from the perspective of creating social change. As science educators, we too can instill in our students that, through science, they can also participate in making positive change. This scientific change also comes with an ethical responsibility. Tough choices are going to have to be made when using this new technology. This is the beauty of literature, the reader is able to read and make interpretations to whatever their present reality is. When she was talking about change, was she writing about the immense possible change that can be created by humans through new technology such as CRISPR? No, but here we are faced with that dilemma. If I could have a conversation with her now, I would ask her opinion about the possibility of human intervention contributing to this type of genetic change. What is gene drive technology and CRISPR, you may be asking? Gene drive is technology that is capable of altering the genomes of entire species. Gene drives ensure that chosen mutations are passed on to nearly all of an animal’s offspring. This causes a higher number of an organism’s offspring to inherit a favorable gene that would ordinarily happen by chance, allowing a mutation to spread quickly through a population.5 If we were to let natural selection take its course, a genetic change in an organism could take an extensive amount of time to spread through the population. The probability of inheriting a mutation carried on a pair of chromosomes is 50 percent. Using CRISPR technology, that probability increases dramatically. It allows a mutation made by CRISPR on one chromosome to copy itself to its partner in every generation. Nearly all the offspring will inherit this change in a much faster time.6 As a science teacher who has not read too many science-fiction books, this sounds like the recipe for a great sci-fi story, except this time it is real and it is here. The idea that we have access to technology like CRISPR left me with my mouth open on more than one occasion during our seminar, Manipulating Biology: Costs, Benefits and Controversies. In Unnatural Selection, Monosson writes that “New vaccines may allow us to slow the evolutionary process, giving us all a fighting chance.”7 Technologies such as vaccines protect against diseases that might ordinarily kill people; thus, diminishing the opportunity for natural selection to remove the least resistant individuals and, hence, any underlying genes responsible for their weakened resistance.8 Over 99 percent of species that ever lived on Earth, are now extinct.9 Should we slow down the evolutionary process by keeping individuals alive in the face of diseases that might ordinarily kill them, perhaps contributing to the preservation of humans as a species here on Earth for longer than what, otherwise, is expected? Is that an ethical thing to do? Or, should we allow nature to take its course? Are we being unethical if we have the technology to save lives but do not use it? I feel that there are more questions than answers when it comes to this topic. Hopefully, our students will begin to ask some of their own. Imagine that you are a 7th grade student walking into science class and your teacher tells you that there is a chance that in the near future we could witness a type of Jurassic Park where woolly mammoths and other extinct species are roaming our Earth once again. As a 7th grader, your first reaction would probably be an open-mouthed, “Wow!”. That’s what my middle-aged reaction was when I first began hearing about all the amazing gene editing tools that science has discovered and developed. I assume most people would have the same initial reaction. Then after some processing, we would probably move from the “Wow” to the “What would all this mean?” This train of thought could take us to so many unknowns that it would make our heads hurt. What else could we do with gene editing technology? How far can we go? As I began reading, I realized that there is an unlimited number of things we could do with this fairly new technology. One potentially useful benefit of gene drive technology would be the eradication of harmful diseases affecting people worldwide. The idea of teaching our students content through a global perspective is something that I feel our society could benefit from. Since the seminar revolves around manipulating biology, my unit topic will focus on manipulating biology to eradicate malaria. The guiding questions throughout the unit will be, is it justifiable to ever force a species into extinction? For example, should we make an attempt to drive malaria-carrying mosquitoes into extinction? Should we use gene drive technology to do this, or should we concentrate on changing their DNA to keep them from transmitting malaria to humans while saving them from extinction? Is it possible to use gene drive technology to cure sickle cell anemia? We will look at the way humans have evolved adaptations to fight diseases in their environments over thousands of years. These adaptations have caused populations in areas with high prevalence of malaria to develop high incidences of sickle cell anemia; heterozygotes with some (but not all) sickle-celled blood cells are the most fit for resisting malaria parasites that invade our blood. The unit will include an understanding of how malaria, through natural selection, has contributed to sickle cell anemia. Students are expected to look at geographical maps and make a connection to the regions with high incidences of malaria, to understand why people whose ancestors lived in these parts of the world are the ones most often affected with sickle cell anemia. Students will understand that human cells contain DNA chromosomes. If we look deep inside the cell into its nucleus, we will find chromosomes made of DNA, double-helix molecules that when unwound reach a length of about 3-meters. All of our cells, except red blood cells, contain DNA. Our DNA molecules contain the instructions for us to develop properly as an individual organism. 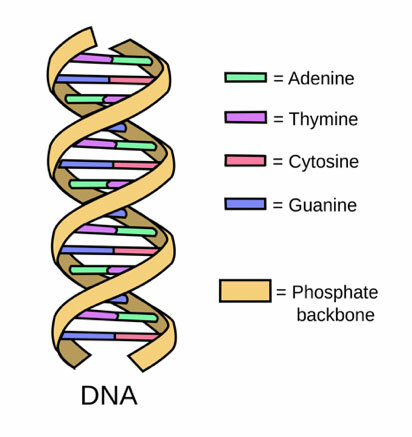 DNA is itself composed of molecules called nucleotides. Each nucleotide contains a phosphate group, a sugar group (deoxyribose), and a nitrogen base. The four nitrogen bases are adenine, thymine, guanine, and cytosine. Adenine and thymine form pairs on the rungs of the ladder and guanine and cytosine form other pairs. It is these base pairs that form the three-meter-long strands of DNA found in the nucleus of our cells. These strands act as a roadmap; they are the language that is read within our cells to make amino acids, which are the building blocks for every protein that is manufactured in our body. Students will understand that mitosis is a cell division process that produces cells that are genetically identical. Human cells have 2 sets of 23 chromosomes, one set from each parent. These are called homologous chromosomes. It is the combination of these sets of chromosomes that will determine the offspring’s genotype, sometimes including genetic diseases or disorders. Malaria parasites are usually transmitted via bites caused by a female Anopheles mosquito that carries the parasite. If the mosquito had previously eaten the blood of an infected person, it can carry the parasite and inject it into another person while having another bloodmeal. Malaria can also be transmitted though blood transfusion, organ transplant, sharing of needles, or from mother to fetus during pregnancy since the malaria parasite is found in the red blood cells of patients. 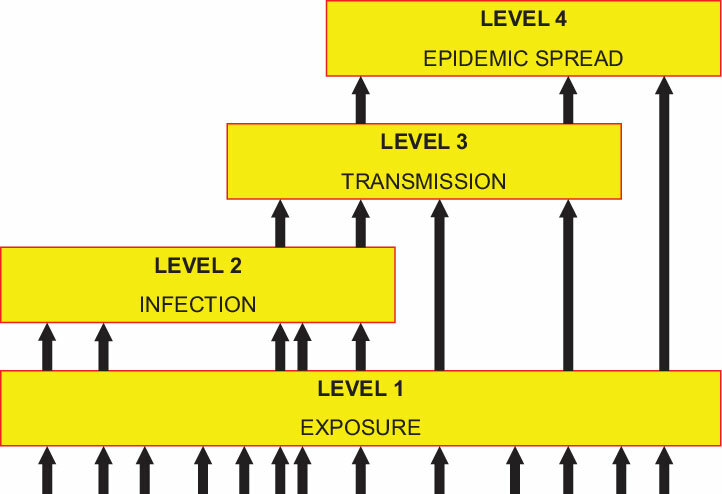 Following is a diagram showing the transmission of malaria. The first vector is a female mosquito carrying the Plasmodium sporozoites. During a bloodmeal of the initial human host, the first vector infects her with the micro-organisms. This causes a liver infection, which then infects the blood. 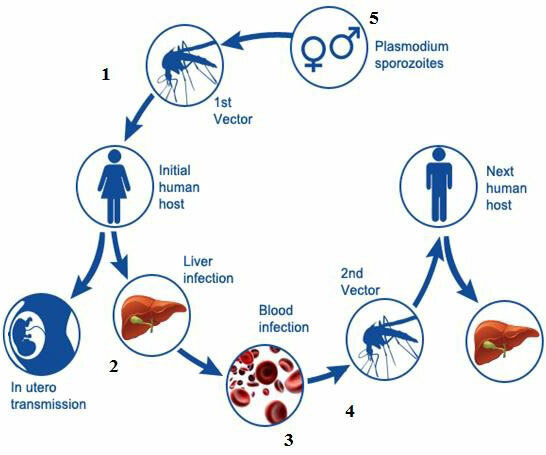 When a second vector (female mosquito) comes to this initial human host for a bloodmeal, the vector takes with it the Plasmodium sporozoites and infects the next human host. The cycle continues. Humans have been adapting to overcome malaria for a very long time. One way that humans have adapted to be able to survive in regions where malaria is prevalent is the sickle cell mutation. During the mid 20th century, it was found that sickle mutations are highly selectively favored in regions where malaria is endemic. People with this mutation were naturally selected since the trait (production of sickle-shaped cells) has some resistance to malaria, because the parasites cannot complete their reproductive cycle in these abnormally shaped cells; however, individuals who are homozygous and make only sickle shaped cells are unhealthy, suffering from anemia because they lack any blood cells that function normally. This is considered to be an evolutionary trade off. The single mutation alters a single amino acid in the hemoglobin protein, changing a hydrophilic amino acid to a hydrophobic amino acid and changing the structure of the protein. The sickle cell mutation defended against malaria by starving the single-celled parasite that causes the disease, since it requires normal blood cells as a food source. This was important because people who lived in these regions where malaria was prevalent, now had some protection against the disease. Carriers of the mutation were considered to be more fit since they had the mechanism that protects them against it. The faulty gene persists because heterozygotes that carry one chromosomal copy of mutation are provided with some resistance to malaria. The problem arises when two copies of the mutation, which is recessive, are passed on to an offspring from the two sets of chromosomes mentioned earlier. This results in people with sickle cell anemia; instead of just the sickle cell trait in a subset of their blood cells. This structural change causes the red blood cells to become hard, sticky, and C-shaped, aggregating in blood vessels and decreasing the red blood cells’ capacity to carry oxygen to the body. Fast track to today. Humans no longer have to suffer from malaria, sickle cell anemia, or have to go through evolutionary trade-offs to combat the disease. This is because a new technology has the potential to drive mosquitoes to extinction and cease the transmission of malaria. If we are trying to deal with the global problem of malaria, and we begin at the source, we can eradicate malaria by getting rid of all transmitting mosquitoes, at least in theory. If we do this, we can save half a million lives each year. If Lauren in the Parable of the Sower had the ability to drive mosquitoes to extinction, what would she have done? Are mosquitoes necessary to sustain our food chains? My students will have to research and attempt to answer these tough questions. Gene editing is a type of genetic engineering in which an enzyme cuts the DNA of an organism at a specific sequence. Then, DNA is inserted, deleted, or modified in that organism. This gives scientists the ability to change its DNA. By changing the organism’s DNA, characteristics can be changed. Gene editing tools have been used for some time now.24 In the past, the procedures used for gene editing have neither been easy nor cheap, until now. With the fairly new gene editing technology, CRISPR, it can cost as little as $30 to edit genomes. It is also a relatively easy procedure for a trained molecular biologist to use, making the method extremely accessible.25 This technology is easily adapted to design a way to insert virtually any desired gene into a specific location in a genome, and allows scientists to make changes in DNA faster and easier than ever before.26 It is the recent discovery of CRISPR that has made the gene editing process much more exciting to the general public. CRISPR-cas9 stands for Clustered Regularly Interspaced Short Palindromic Repeats. The cas9 is the enzyme that is guided by RNA in order to cut the DNA at a specified point. According to Nature: International Weekly Journal of Science, in 2007, scientists determined that the repeats found in CRISPR are part of an evolved bacterial defense system against viruses that attack bacterial cells. To integrate the gene drive mechanism into the genomes of mosquitoes and other engineered organisms, scientists use modified versions of the CRISPR gene taken from bacteria. What are the economic or social benefits of eradicating mosquitoes? Funding for malaria eradication costs millions of dollars a year. The Bill and Melinda Gates Foundation has pledged one billion dollars to end malaria.28 According to the World Health Organization, across Africa, prevention of new cases of malaria between 2001 and 2014 saved an estimated $900 million in case management costs. Insecticide-treated mosquito nets contributed the largest savings. Imagine if we drove the malaria causing mosquitoes into extinction and no longer had malaria, we could use that money and resources on fighting other diseases that are prevalent in our global communities. One question that was commonly asked during our seminar was if we begin to use gene drive technology, such as CRISPR, who will have access to it? Also, will it cause a greater discrepancy between the rich and the poor? Eugenics is the science of improving a human population by controlled breeding to increase the occurrence of desirable heritable characteristics. It developed largely as a method of improving the human race, but fell into disfavor after the perversion of its doctrines by the Nazis. 29 This idea has led to much discrimination against certain groups of people in the history of our country and in others. Experiments on humans, such as the Tuskegee Syphilis Experiment, still occurred in the USA after the Nuremberg Code that outlawed such studies worldwide, following the infamous Nazi experiments on humans during World War II.30 These have been events in the history of science that we wish we could forget, but will gene drive technology bring eugenics to the forefront once again? When talking about eradicating mosquitoes altogether, it could possibly benefit all mankind, since malaria is a worldwide problem. Unfortunately, the unanswered questions still leave room for doubt. Could gene drives cause natural communities somehow to be altered in such a way that it could prove more harmful than beneficial to humans? While teaching this unit, I want to stay as neutral as possible, but these are some of the questions I want my students to begin formulating on their own. Seward Communication Arts Academy is a Pre-K through 8th grade neighborhood school located in the Back of the Yards neighborhood in Chicago. The building is well over 100 years old and is blocks away from Davis Square Park who Mary McDowell, a prominent social reformer, helped build in the late 1800s. Along with the Union Stockyards, our neighborhood has an extensive historical background. Currently, the demographics of our students are 98 percent Latino, mostly of Mexican background and 99 percent low income. Forty percent of our students are English language learners. We are currently becoming an International Baccalaureate school. Through this program, we are encouraged and expected to make global connections in our units. Our students are bright, inquisitive, and in the process of becoming active members of our global society. They truly care about the world they live in and are constantly coming up with ideas of how to make our world better. I intend to use this seminar as a medium to implement a unit that looks at biology through a global perspective. Throughout the unit, we will ask questions about what is ethical and what is not. Ethics will be an integral part of this unit. I really do not see the possibility of teaching this unit without teaching the ethical aspect of what all this entails. A question that Dr. Turner asked throughout the seminar is, “Is it justifiable to ever force a species into extinction? Should we drive mosquitoes into extinction in order to eradicate malaria?” If we look at our students sitting in front of us as potential future scientists, then it is our responsibility as teachers to introduce controversial topics such as gene editing to get them thinking about decisions they may have to make one day. The approach to teaching strategies that I take in this unit is to use content knowledge that I have learned in this seminar, the pedagogical approach that I have learned in my almost 20 years of teaching and lastly the constant reminder to integrate technology as an essential strategy in my teaching. Being an International Baccalaureate candidate school means we follow certain criteria. Here, I have made an attempt to use strategies that help guide instruction that is interesting and meaningful to the student. One strong emphasis in teaching at an IB school, is the designing of performance tasks to evaluate student learning. GRASP Tasks are a type of performance task generally used within the IB program. GRASP stands G: Goal, R: Role, A: Audience, S: Situation, P: Products or Performances, and S: Standards. This task asks the student to place him/herself in the role of a STEM career. As an introduction to the unit, this GRASP task will motivate students to pretend they are a medical professional who will read a scenario on a patient. They will be presented with information on a patient who has sickle cell anemia. Because of their prior knowledge with Punnett squares and recessive traits, they will be able to correctly diagnose the patient. After becoming familiar with sickle cell anemia, I will introduce the connection between malaria and the sickle cell trait. As a summative assessment, I plan to have the students discuss and write about their thoughts on manipulating biology to eradicate malaria. When teaching ethics in the classroom, one should remember to use real life experiences, as in the GRASP task. One suggestion from my research was to bring alumni and practitioners into the classroom to discuss decisions they have had to make in their line of work. They can also share about the consequences of those decisions and how they handled them. This will allow students to see that while we are sitting in the classroom learning about the ethics of gene editing tools such as CRISPR, there are actual people already making those decisions, and one day it may be them. I plan to use articles from publications such as Newsela and Science Daily to teach students to cite specific textual evidence to support their analysis. Since news about gene editing and CRISPR is new technology that is always changing, science teachers can no longer depend on using a science text book that was published over ten years ago. These textbooks may serve as supplemental material but not much more. We need up to date articles that not only have the latest science discoveries, but that are not too challenging for our students to read. Students will use an interactive science notebook for note taking and referring to prior lessons. Students will watch YouTube videos such as Genetic Engineering and Diseases-Gene Drive and Malaria. They will use Cornell notes with Cornell Doodle notes to help understand the content. Throughout the unit, I will read selections from the book where Lauren had to make ethical choices. I will pause to verbalize what I am thinking internally. This modeling will aid the students in their own thinking. Then I will ask the students their own thoughts on the ethical concerns posed in the book. After students become familiar with cells and their functions, we move to the circulatory system-students will role play the carrying of oxygen and carrying away of carbon dioxide from tissues. They will wear two types of uniforms (round and sickle shaped). This will allow the students to see that the sickle shaped red blood cells do not flow as easily through small capillaries as the round shaped red blood cells. After the role play, we will have a whole class discussion and lab write-up on the importance of a healthy circulatory system and the negative effects that sickle shaped cells cause in the circulatory system. Students will complete a Punnett squares lesson where they review recessive and dominant alleles. They will understand that in heterogeneous individuals, people who have inherited the gene from only one parent, the sickle cell gene is rarely expressed. 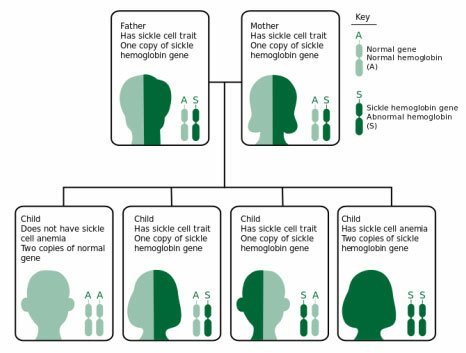 Only homozygous individuals, those who inherited from both parents develop the sickle cell anemia symptoms. Students will carry out a popular lab where they follow steps to extract DNA from a strawberry. After completing the strawberry DNA extraction lab, the students will know that enzymes are used to cut DNA. With CRISPR-cas9, the cas9 is an enzyme which is able to cut a target piece of DNA. After the DNA is cut, CRISPR is then able to alter the organism’s genome, by pasting in a different stretch of DNA. Explain to the students that this process can be used to change a faulty DNA sequence that is responsible for causing disease into a healthy, normal one that is not disease related, as in sickle cell anemia. Or, in the case of mosquitoes that transmit malaria, the process can be used to engineer mosquitoes in a lab and use them to drive a lethal gene or malaria-suppression gene into the individuals in a mosquito population in the wild, eliminating all mosquitoes or reducing the ability for female mosquitoes to transmit the Plasmodium parasite. After the lab, lead a discussion and presentation that explains how CRISPR works. Since it may be a challenging concept to grasp, this part of the activity will be teacher lead. Students will take a template of a gene and make mRNA codons. They will compare a normal hemoglobin allele to a sickle cell allele: GUUCAUUUGACACCCGAAGAA to GUUCAUUUGACACCCGUAGAA. Here, students will notice that a sickle cell allele has a mutation in just one nucleotide of its DNA sequence. They are expected to understand that this slight mutation affects the formation of a new protein. The red blood cell is unable to carry a sufficient amount of oxygen to the body under this new sickle shape. They will also understand that this mutation is an adaptation that kept humans in malaria regions from acquiring the disease. Students will analyze maps using the CDC (Center for Disease Control and Prevention) Malaria Maps. Students will be assigned a country to report on. Areas with malaria transmission are indicated in red, yellow means malaria is present in some areas, and green represents that no malaria cases have currently been found in that area. They will also make the connection of how sickle cell anemia mostly affects people from these geographical areas. At the conclusion of the unit, the students are expected to end with more questions than answers. It is this inquisitive thirst for knowledge that a budding scientist should acquire since their early years. When science writer Carl Zimmer came to visit our seminar, something that he said made me understand why it is important to teach this now. He talked about how students may not get to learn about gene editing tools like CRISPR once they leave their high school years, unless they go on to major in science during their college years. The time is now to teach them about the science behind gene editing and the ethical conversations and decisions that we, as humans, cannot detach ourselves from. ALLISON, A. C. "Protection Afforded by Sickle-cell Trait against Subtertian Malareal Infection." British Medical Journal. February 06, 1954. Accessed August 18, 2018. https://www.ncbi.nlm.nih.gov/pubmed/13115700. Arrow, Kenneth. Saving Lives, Buying Time: Economics of Malaria Drugs in an Age of Resistance. Office of Health Economics, 2006. Baumgaertner, Emily. "In a Rare Success, Paraguay Conquers Malaria." The New York Times. July 06, 2018. Accessed August 09, 2018. https://www.nytimes.com/2018/07/06/health/paraguay-venezuela-malaria.html. Butler, Octavia E. Parable of the Sower. New York: Seven Stories Press, 1993. Callaway, Ewen. "Controversial CRISPR 'gene Drives' Tested in Mammals for the First Time." Nature News. July 06, 2018. Accessed August 18, 2018. https://www.nature.com/articles/d41586-018-05665-1. "Centers for Disease Control and Prevention." Centers for Disease Control and Prevention. April 26, 2017. Accessed August 18, 2018. https://www.cdc.gov/. "CRISPR Timeline." Broad Institute. March 20, 2018. Accessed August 18, 2018. https://www.broadinstitute.org/what-broad/areas-focus/project-spotlight/crispr-timeline. Doudna, Jennifer A., and Samuel H. Sternberg. A Crack in Creation: Gene Editing and the Unthinkable Power to Control Evolution. Boston: Mariner Books, Houghton Mifflin Harcourt, 2018. James, Anthony A. "Gene-drive Technology Must Be Developed in a Safe, Ethical Way." STAT. July 09, 2018. Accessed August 18, 2018. https://www.statnews.com/2018/07/10/gene-drive-technology-safety-ethics/. Instituto Gulbenkian de Ciencia. "Mystery solved: How sickle hemoglobin protects against malaria." ScienceDaily. www.sciencedaily.com/releases/2011/04/110428123931.htm (accessed August 9, 2018). Ledford, H. "CRISPR, the Disruptor." Nature. June 04, 2015. Accessed August 18, 2018. https://www.ncbi.nlm.nih.gov/pubmed/26040877. Macias, Vanessa, Johanna Ohm, and Jason Rasgon. "Gene Drive for Mosquito Control: Where Did It Come from and Where Are We Headed?" International Journal of Environmental Research and Public Health 14, no. 9 (2017): 1006. doi:10.3390/ijerph14091006. Monosson, Emily, and Flipsen. Unnatural Selection: How We Are Changing Life, Gene by Gene. Island Press, 2015. Negrut, Mara. "Environment." Octavia E Butlers Parable of the Sower Discussion Guide. Accessed August 18, 2018. http://parableofthesoweratunc.web.unc.edu/2017/12/ecocriticism/. Puiu, Tibi. "CRISPR Edit Makes Mosquitoes Far Less Likely to Pass Malaria." ZME Science. March 08, 2018. Accessed August 18, 2018. https://www.zmescience.com/medicine/crispr-malaria-mosquitoes-0432/. "Return of the Woolly Mammoth and 3 Other Ways CRISPR Could Change the World." Genetic Literacy Project. January 12, 2018. Accessed August 18, 2018. https://geneticliteracyproject.org/2017/03/07/return-woolly-mammoth-organs-grown-pigs-ways-crispr-change-world/. Ridley, Matt. Genome: The Autobiography of a Species in 23 Chapters. New York: MJF Books, 2010. "Socratic Seminar." Facing History and Ourselves. Accessed August 18, 2018. https://www.facinghistory.org/resource-library/teaching-strategies/socratic-seminar. Stearns, Stephen C., and Jacob C. Koella. Evolution in Health and Disease. Oxford: Oxford University Press, 2013. Stein, Rob. "To Fight Malaria, Scientists Try Genetic Engineering To Wipe Out Mosquitoes." NPR. December 14, 2016. Accessed August 18, 2018. https://www.npr.org/sections/health-shots/2016/12/14/504732533/to-fight-malaria-scientists-try-genetic-engineering-to-wipe-out-mosquitoes. The Immortal Life of Henrietta Lacks: BookTalk Notes for Rebecca Skloots The Immortal Life of Henrietta Lacks. Fayetteville, AR: Fayetteville Public Library, 2011.
Zimmer, Carl. She Has Her Mother's Laugh: The Powers, Perversions, and Potential of Heredity. New York, NY: Dutton, 2018.
Zimmer, Carl. "How One Child's Sickle Cell Mutation Helped Protect the World From Malaria." The New York Times. March 08, 2018. Accessed August 18, 2018. https://www.nytimes.com/2018/03/08/health/sickle-cell-mutation.html. The International Baccalaureate mission statement begins with the phrase, IB aims to develop inquiring, knowledgeable and caring young people who help create a better and more peaceful world through intercultural understanding and respect. Since we are an IB candidate school, with a high stress on the implementation of project based learning and in accordance with the NGSS (Next Generation Science Standards), our 7th graders learn about life science using an inquiry based model while making global connections. While this unit will focus on all four criterions of an International Baccalaureate assessment, I will concentrate on Criterion D; Reflecting on the Impacts of Science. In this unit, the student will be able to 1.) Explain the ways in which science is applied and used to address a specific problem or issue and 2.) Discuss and evaluate the implications of using science and its applications to solve a specific problem or issue. The IB Key Concept: Relationships states that there are connections and associations between properties, objects, people and ideas-including the human community’s connections with the world in which we live. Any change in relationship brings consequences-some of which may occur on a small scale, while others may be far reaching, affecting large networks and systems such as human societies and the planetary ecosystem. When you are finished viewing curriculum units on this Web site, please take a few minutes to provide feedback and help us understand how these units, which were created by public school teachers, are useful to others.